The former Kingdom of Hejaz occupied approximately 150,000 square miles in the north western region of Saudi Arabia extending from the Gulf of Aqaba in the north to Mecca approximately 750miles to the south. Opinions vary as to the exact size of Hejaz and I have been unable to find any map showing the location of the inland borders. 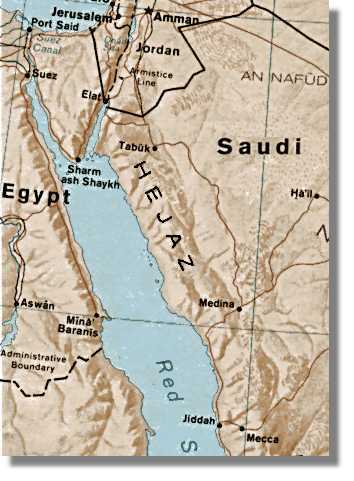 Reference to the map shows that the area is divided roughly into two parts, the coastal and inland regions, divided by a mountainous belt running North and South about twenty miles broad situated about five miles inland from the Red Sea coast, (The name Hejaz suggests "divided"). The region to the East of these mountain ranges is flat desert sand with the Hejaz railway line running from Damascus to Medina. 1258 Hejaz was under Egyptian control. 1517 Turkish suzerainty but with nominal rule by the Hashemite sherifs of Mecca. 1845 Hejaz again came under direct Turkish control. It was during this period that the Turks built the Hejaz railway (started in 1900, completed in 1908) which ran from Damascus to Medina (almost 1,100 miles). It was intended to improve communications and provide a major route for pilgrims travelling from the Turkish Ottoman Empire to Medina. 1916 (February), with the aid of T.E. Lawrence, Turkish authority in the Hejaz was destroyed and independence proclaimed by Husayn bin Ali, the Grand Sherif of Mecca. 1924 Husayn bin Ali was defeated by Ibn Saud, ruler of Nejd and founder of Saudi Arabia who annexed his domain. 1932 the formal union of Hejaz and Saudi Arabia was proclaimed.